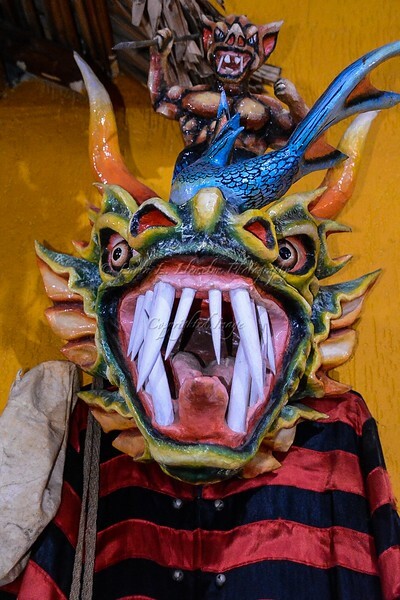 Captured in this photo is a diablico costume used in #Panama during folkloric celebrations, namely the celebration of Corpus Christi. La Villa, in the province of Los Santos, is the epicenter of this celebrations in Panama, and it is said that location is where the strongest and closest ties to the origins of these festivities lie, since the Spanish colonization of the province. In medieval times the Catholic Church took to incorporating mini theatrical plays inside the sacred wall during the Corpus Christi festivities, in additional to the typical processions though the villages, for the purpose of evangelization. It is these plays that have turned into the dances currently performed by masked men with painted bodies. Now fully clothed, the masks are unique and very elaborate, but still a pretty frightening.